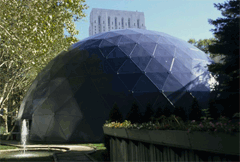 Exterior view of Rockefeller University's striking Caspary Auditorium. Interior view of Caspary Auditorium and the stage for The Great Challenge panels. The premiere of The Great Challenge empanelled eight of America's foremost educators for the panel discussion, Education for What? America's fascination with 1950s Television slowly--and inevitably--eclipsed the popularity of Radio throughout the Nation. And though popular Television was acquiring its share of critics, the die had been cast. Radio's popularity was on the wane. Radio's Golden Age reluctantly gave way to Television's Golden Age. But Radio wasn't about to give up without a fight. The 1950s found Radio mounting some of the finest programming of its [then] 30-year history. The major networks, still somewhat wary of the enduring strength of Television's growing popularity often mounted simulcasts of Television broadcasts that could just as easily lend their impact to Radio. By far the easiest of the programs to simulcast or air on a staggered schedule over both Television and Radio were the popular panel and public affairs programs of the era. Long running news, commentary, and discussion panel programs from the Golden Age of Radio inevitably found their way to Television. Iconic programs such as Meet the Press and Crossfire successfully managed to straddle both Radio and Television. Throughout the 1950s, several important public affairs programs of the era found their way to both Radio and Television, either in simulcast or in staggered scheduling over Television, then Radio. These programs were generally one-offs or short series'. NBC-Radio's Monitor programming was one of the more innovative responses to the encroachment of Television, airing all manner of weekend programming--comedy, variety, science fiction, human interest, and public affairs--for thirty-six to forty hours each weekend between June 1955 and 1961. Sunday morning's Meet The Press aired under weekend Monitor's programming schedule, while airing simultaneously over NBC Television. CBS was by no means a newcomer to important panel discussions or public affairs programming. Edward R. Murrow and his 'Murrow's Boys' had become legendary War correspondents from the earliest days of World War II. Murrow's own hard-hitting interview and commentary programs routinely made headlines throughout the 1950s--over both Radio and Television. Murrow's Boys also found their own niches over CBS Radio and Televison, as well as over ABC and NBC in time. Dr. Harold B. Gores, superintendent of schools, Newton, Mass. The premiere Radio broadcast of The Great Challenge aired over CBS-Radio two to four days later, a pattern that the series maintained over most of its airings over the following three seasons. But while the CBS Television broadcasts aired on Sunday afternoons, the edited Radio version aired in mostly late-night timeslots--either Tuesday or Thursday evenings for the first season; the second season aired on either Tuesdays or Wednesdays, and the third Radio season on Tuesdays. The Television broadcasts of The Great Challenge were either 30 minutes or one hour in length. The first two seasons of Radio rebroadcasts were always 30 minutes, edited down for the 30-minute format. 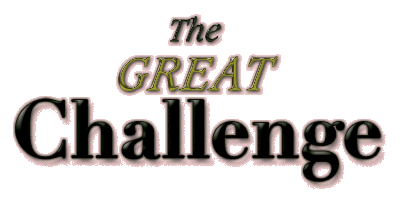 The third season of both the Television and Radio versions of The Great Challenge were hour-long programs. Program 1 - Education for What? Program 3 - How Strong Is Our Economy? Program 6 - What Makes An Effective Foreign Policy? Program 7 - What Beliefs Sustain the Free World? Program 1 - Where Is Science Taking Us? Program 2 - Is America Anti-Intellectual? Program 3 - Can Democracy Meet the Space Age Challenge? Program 4 - Is America's Journalism Meeting Its Responsibilities? Program 5 - Is the American Public Getting the Information It Needs? Program 1 - Can We Improve Our Education For Leadership? Program 2 - How Can We Get Things Done In A Democracy? Program 3 - What Role Can the Mass Media Play In Producing Effective Democratic Leadership? All three seasons of The Great Challenge empanelled the foremost proponents in their respective fields to discuss some of the era's most pressing issues. As must be apparent from the log details below, CBS had no trouble attracting the world's best and brightest from the realms of Academia, Medicine, Politics, the Military, and the Arts to The Great Challenge. Dr. Harrison Brown, author and professor of geo-chemistry at the California Institute of Technology has been added to the roster of distinguished educators comprising the symposium on problems facing education, the premiere program of "The Great Challenge," Sunday, Feb. 23 on the CBS-TV network (5-6 p.m.). The hour-long broadcast, titled "Education For What?" will introduce a discussion format new to television. 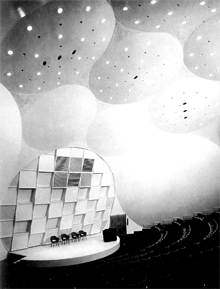 The program will get under way in the unique setting of the Capary auditorium of the Rockefeller Institute in New York City. Dr. Brown and Max Lerner, columnist for the New York Post, will be seated in the forefront of the audience in the recently completed dome-amphitheater and will open the discussion with a statement of the principal challenges confronting educators today. These challenges will be taken up by a group of distinguished educators seated on stage: Clarence Faust, vice president of the Ford Foundation and president of the Fund for Advancement of Education; Dr. Wallace Sterling, president of Stanford university; Rev. Theodore M. Hesburgh, president of Notre Dame university; Dr. James L. Morill, president of the University of Minnesota; Dr. Harold Taylor, president of Sarah Lawrence college; and Dr. Harold Gores, superintendent of schools, Newton, Massachusetts. CBS News Correspondent Howard K. Smith is moderator for the series. An invited audience representing key educational groups will attend "The Great Challenge" symposium and, during the concluding portion of the hour many of these guests will have an opportunity to question the participants on stage. The theme of "Education For What?" is an assessment of the tasks facing education in a rapidly changing modern world. The members of the symposium will concentrate their attention on the substance and function of education in the face of new challenges from abroad. The assignment for the symposium, on each broadcast during "The Great Challenge" series, is an attempt to draft a talement for the American people which will clarify and summarize some of the primary issues and problems in the area under discussion. Six scientists will participate in a television symposium on "The Role of the Scientist in America's Future." It will be presented by CBS, March 16 in the network's series titled "The Great Challenge." Scientific issues will be discussed by Dr. Edward Teller, a physicist who played a leading part in the development of the hydrogen bomb; Dr. Joseph Kaplan, chairman of the U. S. national committee of the International Geophysical Year; Dr. Howard L. Bevis, chairman of the President's committee on scientists and engineers; Dr. Clifford C. Furnas, chancellor of the University of Buffalo; Dr. Roger Revelle, director of the Scripps Oceanographic Institute and Dr. Paul Sears, Yale University botanist. Another participant in the discussion will be William L. Laurence, science editor of The New York Times. "The Great Challenge" series, which made its debut Sunday, is designed to explore various issues confronting this country. NEW YORK (UPI)--Sunday afternoon has been called the intellectual ghetto of TV, but I wonder if anyone has ever really felt any intellectual ferment yeasting up within him after spending Sunday with the tube. My feelings are usually those of disappointment: The panel shows are frequently just contests of personality, the interview shows frequently just essays in pios banalities, the filmed background shows usually just oatmeal. What Sunday lacks is spine, depth and freshness. Sunday, CBS-TV brought back its "Great Challenge" series and I know with a show like this a reviewer is supposed to be "constructive"--that is, overlook its sodden texture. After all, it isn't a Western and it means well--shouldn't we pretend, therefore, that it is "stimulating" or "absorbing" or "valuable?" Sunday, "The Great Challenge" tried to tackle the question "where is science taking us" without ever getting close to the nut of its topic. As in so many of these Sunday things, there was too much wandering, too little purposiveness, too much acceptance of the torturous inanities express by fellow panelists. A good information show should be built on lines just like those of a good drama, a good song, a good joke. It should have some conflict, a sense of direction and discipline. Flabby give-and-take isn't enough particularly when it lends to unmeaningness like this Sunday. "The fact that the span of human life has been increased during the past 50 years by somewhat more than 20 years gives to men, women and children an opportunity to live longer..."
I might add that everyone accepted this without a blink. On the other side of the coin, Leonard Bernstein on CBS-TV Sunday gave a demonstration of what Sunday daytime could be like--if, indeed, it must be an "intellectual ghetto." Given 60 minutes to explore musical invention, Bernstein fanned oxygen into the afternoon. His hour had a sense of structure--Bernstein built solid block upon block, did it tersely and with some wit, and moved steadily toward a meaningful climax. As a result, when the hour was over there was a feeling of shared experience, of a quickening of the emotions and intellect, of fulfillment. If this sort of thing means being ghettoized, I would say hurrah for the ghetto. Unfortunately, it is a lonely exception. Sen. John F. Kennedy (D., Mass. ), former government official Arthur Larson, and university professors Clinton Rossher of Cornell and Merle Fainsod of Harvard will join moderator Eric Sevareid in exploring the question "Can Democracy Meet the Space Age Challenge?" on "The Great Challenge" Sunday on CBS (1:30-2:30 p.m.). The symposium, third in the current series, will attempt to appraise the capacity of institutions in a democratic government to meet challenges such as the current intensified Soviet competition and to keep pace with the increasing complexity of our society in the space age. is widely known through his most recent books, ''A Republican Looks At His Party," and "What We Are For." Dr. Rossiter is professor of American institutions and chairman of the Department of Government at Cornell and author of several , books on American government. Dr. Fainsod, professor of government at Harvard, is a leading authority on the government of the Soviet Union and author of several books on government, including "How Russia Is Ruled." In discussing the processes of government and the functions of governmental institutions in a democracy, the participants will debate such questions as: How viable today are the various institutions of a free government? and can these institutions act with the wisdom the times demand? NO SECRET CORNER of the world, however tiny, is hidden from the curious cameras of our far-flung correspondents, such as, for example, Tavisak Viryasiri, a wealthy Bangkok businessman whose sideline is working as a CBS News cameraman. The moment the Thai government cracked down on narcotics Tavisak and his camera infiltrated a group of local opium dens and took some fascinating pictures. Perhaps you saw them on a recent Saturday news program the customers walking into a bunk-filled room, blue with smoke, buying their opium pellets, preparing their pipes, and sliding into their separate cubicles to sleep, perchance to dream. After getting his films Tavisak then went to the Klong Rangsit Sanitarium and showed you Thai doctors attending long-term addicts and their methods of rehabilitation; similar in so many ways to our own. Altogether it was pretty impressive and informative journalism, in the best Pulitzer Prize-winning tradition, thanks to Tavisak, CBS News and in the last analysis, television. Every year the Freedoms Foundation at Valley Forge presents awards to television broadcasters for programs which "create or support" a better understanding of the nation's fundamental traditions. Last week it gave its George Washington Honor Medal to the CBS Television Network, for a full-hour program called "Government and the Democratic Process" one of a series of seven programs entitled The Great Challenge. Perhaps you remember seeing it. 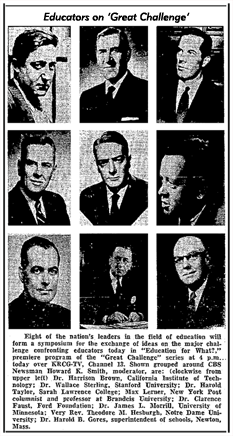 A group of distinguished historians and journalists including, among others, Prof. Allan Nevins of Columbia University, Prof. Arthur Schlesinger, Jr. of Harvard University, Arthur Krock of The New York Times and Emmet Hughes of Life Magazine sharply examined the quality of American leadership and the capacity of democratic institutions to act swiftly in moments of crisis. The Freedoms Foundation called it an "outstanding achievement." It should come as no surprise that CBS selected Howard K. Smith and Eric Sevareid to moderate The Great Challenge for its three seasons. Rhodes Scholar Howard K. Smith was clearly up to the task of steering, reigning in and moderating the world's greatest thinkers in their respective areas of expertise. And Eric Sevareid, educated at the University of Minnesota [Poli-Sci], in London, and later at the Sorbonne in Paris, was no shrinking violet either. Both seasoned war correspondents, their experience with Murrow's Boys for CBS equipped both of them quite well for holding their own among a stage full of large egos. Indeed, it was the profound mutual respect between both the panelists and moderators of The Great Challenge that made for truly compelling, yet spirited, discussions of the three seasons' fifteen wide-ranging topics. 58-02-27 01 Education for What? 59-02-24 01 Where is Science Taking Us? 60-03-29 01 Can We Improve Our Leadership for Education? Digital Deli contributor Gary Kuklo; The New York Times; Bob Lowry's UPI Collection; Bismarck College's Tribute to Eric Sevareid; . The most helpful provenances were newspaper listings. All rights reserved by their respective sources. Article, log, and independent research results copyright 2011 The Digital Deli Online--all rights reserved. Any failure to attribute the results of this copywritten work will be rigorously pursued. 10:30-11--The Great Challenge: "Education for What?" --first in a series of seven symposiums with authorities in specific fields discussing new challenges facing this country today. Howard K. Smith is moderator--(WCBS). 10:30-11--The Great Challenge: A symposium on "The Role of the Scientist in America's Future," with Dr. Edward Teller, Dr. Joseph Kaplan and other authorities in scientific fields--(WCBS). How Strong Is Our Economy? 10:30-11--The Great Challenge: "How Strong Is Our Economy?" --a symposium with Barbara Ward, Leo Cherne, Leon Keyserling and other authorities in the field of economics--(WCBS). 10:30-11--The Great Challenge: Symposium on "Human Relations: Individual Relationships in a Mass Society," with Dr. Lawrence S. Kubie, Clinical "Professor of Psychiatry at Yale University; Dr. Ralph W. Tyler, director of the Center for Advanced Study in the Behavioral Sciences at Stanford; Dr. Brock Chisholm, former Director-General of the World Health Organization; Lionel Trilling, literary critic and educator; Erich Fromm, psychoanalist and author, and Dr. William Foote Whyte, director of the Social Science Research Center at Cornell University--(WCBS). A symposium. on human relations will be heard on "The Great Challenge" broadcast at 9:30 p.m. today on radio station KNX. "Individual relationships in a mass society" will be the topic discussed by Brock Chisholm, first director-general of the World Health organization; Erich Fromm, psychoanalyst and author; Lawrence S. Kubie, clinical professor of psychiatry at Yale; Lionel Trilling, literary critic and. educator; Ralph W. Tyler, director of the Stanford center for' advanced study in the behavioral sciences; and William Foote Whyte, director of the social science research center at Cornell University. 10:30-11--The Great Challenge: Symposium on "Government and the Democratic Process" with Arthur Krock, Allan Nevins, DeWitt Clinton, Arthur Schlesinger, Jr., Emmett Hughes, Dr. Elmer Schattschneider and Ernest Lindley--(WCBS). What Makes An Effective Foreign Policy? 10:30-11--The Great Challenge: Symposium on "What Makes An Effective Foreign Policy?" Participants include Anthony Nutting, former British Minister of State for Foreign Affairs; Lester B. Pearson, former Canadian Secretary of State for External Affairs and 1957 Nobel prize winner; Dean Rusk, president of the Rockefeller Foundation, and other authorities in the field--(WCBS). What Beliefs Sustain the Free World? 10:30-11--The Great Challenge: Symposium on "What Beliefs Sustain the Free World?" with Prof. Arnold J. Toynbee, historian; Dr. Reinhold Niebuhr of the Union Theological Seminary and Dr. Charles Frankel, Professor of Philosophy at Columbia University--(WCBS). Where Is Science Taking Us? 10:30-11--The Great Challenge: First in series of five symposiums on contemporary problems. Tonight, "Where Is Science Taking Us?" discussed by Dr. J. Robert Oppenheimer, Dr. Detlev W. Bronk and Dr. Jerome B. Weisner. Eric Severeid is moderator--(WCBS). 10:30-11--The Great Challenge: "Is America Anti-Intellectual?" discussed by McGeorge Bundy and John Kenneth Galbraith of Harvard; Robert M. Hutchins, president of the Fund for the Republic, and Edward H. Litchfield, chancellor of the University of Pittsburgh. Eric Severeid is moderator--(WCBS). Can Democracy Meet the Space Age Challenge? 10:30-11--The Great Challenge: "Can Democracy Meet the Space Age Challenge?" discussed by Senator John F. Kennedy; former Government official Arthur Larson, and Professors Clinton Rossiter of Cornel and Merle Fainsod of Harvard--(WCBS). Is America's Journalism Meeting Its Responsibilities? 10:30-11--The Great Challenge: "Is America's Journalism Meeting its Responsibilities?--first of two-part appraisal of journalism in this country today. With Barbara Ward, economist; John Fischer of Harper's magazine; Eugene C. Pullilam, newspaper publisher; J. Russell Wiggins, newspaper executive, and Sig Mickelson, a C.B.S. vice president. Eric Sevareid is moderator--(WCBS). Is the American Public Getting the Information It Needs? 10:30-11--The Great Challenge: "Is the American Public Getting the Information It Needs?" discussed by James Hagerty, James Reston, Arthur Schlesinger, Jr., and others. Eric Sevareid is moderator--(WCBS). Can We Improve Our Education For Leadership? 10:05-11--The Great Challenge: First of three symposiums. "Can We Improve Our Education for Leadership?" discussed by Governor Rockefeller, Thomas K. Finletter, Marquis W. Childs and Victor L. Butterfield--(WCBS). How Can We Get Things Done In A Democracy? 10:05-11--The Great Challenge: "How Can We Get Things Done in a Democracy? Discussed by Senator Henry M. Jackson, Dr. Henry M. Wriston, Robert L. Heilbroner and Maj. Gen. John B. Medaris. Howard K. Smith is moderator--(WCBS). What Role Can the Mass Media Play In Producing Effective Democratic Leadership? 10:05-11--The Great Challenge: "What Role Can the Mass Media Play in Producing Effective Democratic Leadership?" discussed by Gilbert Seldes, Frank Pace, Jr., Leo Rosten, Marguerite Higgins and Fred W. Friendly. Howard K. Smith is moderator--(WCBS). Howard K. Smith, a pioneering television news commentator, anchor and reporter who started his career as a wire-service reporter and moved into radio during World War II, has died at the age of 87. Smith died at his home in Bethesda, Md., Friday night. Following a journalism career that spanned more than five decades, Smith spent the last years of his life preparing projects for public television, lecturing at colleges and to business groups and writing. His autobiography Events Leading Up to My Death, The Life of a Twentieth-Century Reporter, was published in 1996. He married Benedicte (Bennie) Traberg, a Danish journalist, in March 1942 and had two children, Jack Prescott Smith, and Catherine Hamilton Smith. The couple lived at High Acres, an estate on the Potomac River in Bethesda, Md., near Washington. Smith went to work for United Press in London in 1939, with war looming over Europe. Stationed in Berlin with United Press and later CBS radio at the start of World War II, Smith was the last American reporter to leave Berlin on Dec. 6, 1941, only hours before the United States declared war on Germany. His final days and his narrow escape was retold in a best-selling book he wrote in only a few weeks, Last Train from Berlin, published in 1942, said to be one of the best commentaries written on the period. Smith remained in Europe as a radio reporter and war correspondent with the 9th Army in France, Holland and Germany throughout the war and covered the Nuremberg war crimes trials. 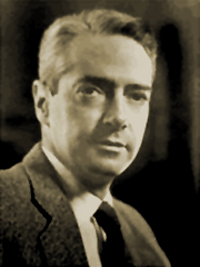 Following the war, he became CBS's chief European correspondent, taking over for Edward R. Murrow in 1946. He returned to the United States in 1957 to become Washington correspondent for CBS, but resigned and moved to ABC in 1961 after a dispute over editorial policy concerning a civil rights documentary. While in Washington, Smith knew every president from Eisenhower to Johnson. At ABC, Smith in 1969 became television evening news co-anchor with Frank Reynolds. Although Smith was the first broadcast journalist to have an exclusive interview with President Richard Nixon, he was also the first to call for Nixon's resignation or impeachment, declaring that Nixon needed to handle the matter "on his own time." In 1960, Smith was the first broadcaster to moderate a presidential debate between candidates John F. Kennedy and Nixon. He repeated the effort for the League of Women Voters in the 1980 debate between Jimmy Carter and Ronald Reagan. Born in Ferriday, La.,, on May 12, 1914, to night watchman Howard K. and Minnie Cates Smith, Smith's early years were spent in Depression poverty. He was an excellent student and an outstanding high school athlete. He was encouraged by his teachers to try for a scholarship to Tulane University offered by the city of New Orleans to the city's best student. When he won, Smith entered college knowing he wanted to be a writer, and soon discovered that journalists were the only writers who got paid regularly. Smith enrolled in journalism and studied German in college, then was chosen for a tuition-free summer to study at Heidelberg University after his graduation in 1936. Working his way to Germany as a deckhand on a freighter, Smith used his German language training to tour Germany and much of Europe and then returned to the United States to take reporting job with the New Orleans Item-Tribune. There, Smith worked his way from rewrite into writing analytical pieces on the changes he had seen taking place in Nazi Germany. Friends and teachers urged Smith to apply for a Rhodes scholarship, and Smith was astonished when he was selected and found himself at Merton College of Oxford University in May 1937. Following his studies, Smith decided to remain in Europe and took a reporting job in London with United Press (now United Press International) which in 1940 sent him to Berlin as its junior reporter earning $25 per week. When CBS offered him five times his UP salary to fill a radio assignment a year later, Smith leaped at the opportunity although he had never considered becoming a broadcast journalist. "I was alarmed at suddenly having top responsibility in a warring capital for a great network," Smith wrote in 1996. "When we knew one another better, I asked Paul White (head of CBS News in New York) how he came to have faith in an unknown. He said, 'I knew you were well brought up, from a top school.' I said, 'Oxford?' He said, 'No. United Press.'" By December 1941, events began to take place quickly that Smith would later recount in his hastily written but well-received commentary Last Train from Berlin. Smith had attracted the wrath of high Nazi officials by refusing to read radio scripts the Berlin government had prepared for accredited foreign reporters. When Smith refused, his accreditation was recalled and he was denied use of facilities in which to work. With no exit visa, Smith was at the mercy of the Berlin government which could arrest him at any moment. When his network learned that the Nazi government had withdrawn Smith's accreditation and not the network's, the network informed the German Foreign Office it was recalling Smith and requested the Foreign Office to accredit a stringer, who never arrived, who would replace Smith. Smith wrote "Satisfied that it would have a hostage against my misbehavior, it had an official notify me that I would receive an exit visa when he got around to it. It would stipulate, I was told, that I must be out of the country within 48 hours after receiving it. "But five days later, I was called to the Foreign Office, and the liberating document was stamped in my passport," Smith wrote in Events Leading Up to My Death. "I immediately reserved a berth on the night train to Basel, Switzerland ... That was Dec. 6. I was so pleased ... at the favorable turn my life had taken that I considered partying on for a day longer and leaving Berlin on the second night of my 48 hours, which would be Dec. 7, 1941. I shudder to think how events might have transpired, had I done so." Smith, who had moved out of the ABC co-anchor spot to concentrate on commentary in 1975, left ABC in 1979 at age 65, saying that as the network restructured the news broadcasts in an attempt to improve ratings his job "had no real function anymore." He also was critical of the network's four-anchor format that included Reynolds, Peter Jennings, Barbara Walters and Max Robinson, which he termed a "Punch and Judy Show." Smith was a much-honored newsman and recipient of a dozen honorary degrees. He won a Peabody award in 1960, an Emmy in 1961 and was winner three times of the Overseas Press Club's award for reporting. He won high honors for his documentary "The Population Explosion," and in 1971 the University of Missouri gave him its Journalism Medal and later the Lowell Thomas citation. Birthplace: Velva, North Dakota, U.S.A..
Suzanne St Pierre, died Washington DC 9 July 1992. 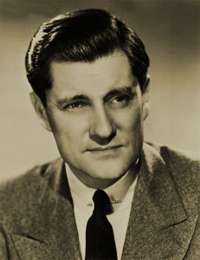 ERIC SEVAREID was one of the talented team of CBS news correspondents recruited by Edward R. Murrow whose vivid broadcasts from the London blitz helped to persuade the neutral United States that Britain was not defeated, and would not be. Sevareid was then a tall, handsome, massive-shouldered man of 28. He had been working as a newspaperman in Paris before Murrow urged him to switch to CBS on hearing that Hitler had made his pact with Stalin. He came from North Dakota, of Scandinavian stock, and was sometimes called 'the gloomy Norwegian'. He had scored an immense scoop as the first newsman to report that France was about to surrender to the Germans and seek an armistice. Sevareid later described the details of his experiences in China in a fascinating autobiography Not so Wild a Dream (1946). He subsequently covered the Italian campaign and was with the first wave of American troops into southern France. Much of the credit for toppling the freewheeling career of Senator Joseph McCarthy of Wisconsin is given to Murrow for his famous 1954 See It Now television programmes, in which McCarthy was seen to condemn himself out of his own mouth. But Sevareid was prepared to stick his head over the parapet before his friend Murrow did so. Throughout 1953, in his thoughtful, late evening radio commentaries, he regularly took McCarthy to task for his unsubstantiated accusations of disloyalty and treachery. That was at a time when too many Washingtonians were running for cover. In 1959 Sevareid returned to London as a base for a roving assignment to report on all the main European developments. During the following two years he broadcast many radio dispatches that showed the affection he had for Britain. But it was in the 1960s that he reached the peak of his career. Walter Cronkite, every American's favourite uncle, was the anchorman of CBS Evening News, and gave the hard news of the day. Sevareid followed with his beautifully written critical analysis of the significance of the main items. Cronkite said: 'Eric was one of that small number of news analysts, commentators and essayists who truly deserve to be called distinguished.' A similar comment came from Dan Rather, who succeeded Cronkite as the anchorman of the CBS Evening News. He described Sevareid as 'a philosopher, writer, reporter and teacher, with no equal in the history of broadcast journalism'.